NEW BUILD OFF ROAD TEARDROP FOR THE FAMILY!!! 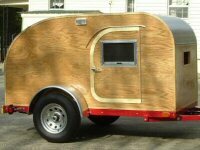 Franks First Build [10/13/2012] "FRANK'S DOG HOUSE"
The Pocket Knife Camper....What color???? Chumptastic Budget Build 10 days $500 -7 year update! Hot Rod...Burning down the house!!! Simple Foamie - 5x8 with galley.